Beautiful Nose Art t-shirt captures the heroism of the Memphis Belle and her crew. 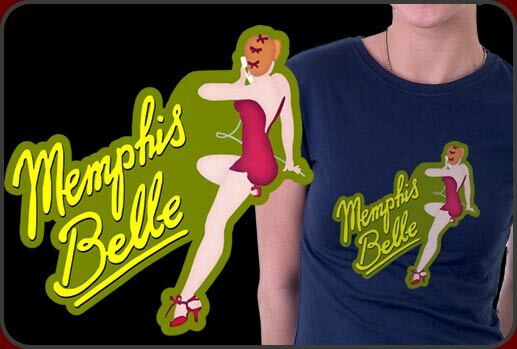 The historic Memphis Belle is the subject of this gorgeous Nose Art T-shirt design. The Memphis Belle was a B-17F Flying Fortress that flown during the Second World War. It was the very fist U.S. Army Air Forces heavy bomber to complete 25 combat missions. This important nose art t-shirt design is a great remembrance of the fighters and bombers that flew in WWII and it's a beautiful keepsake to own and wear. Our Nose Art T-shirts print beautifully on either light or dark color shirts and we have hundreds of great combinations to choose from.